Look what I came across today totally by accident! OK….it wasn't by accident. But seriously, I wanted to find out what happened to Little Dot. Don’t know her? How about Little Audrey, Little Lotta, Richie Rich, Wendy the Good Little Witch or Casper the Friendly Ghost? As a kid I thought it was just the best that these characters would have adventures without leaving their block. 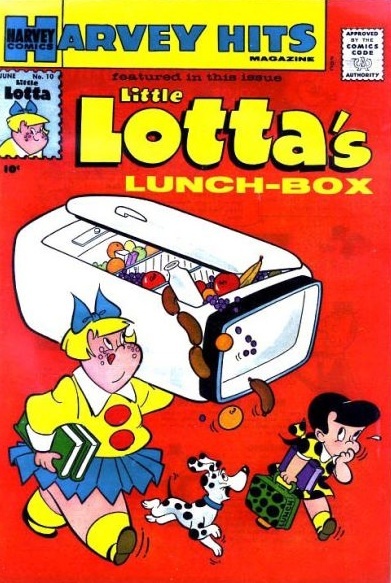 Little Dot could be waiting to cross the street and Little Lotta (kind of on the chunky side so politically incorrect now) would come along and lift a car out of her way. Did you hear? LIFT-A-CAR! Wow. Then, Richie Rich would be waiting for his parents and even though he didn’t need it…..money would fall into his hands from who knows where. He just couldn’t escape it, poor little guy. But back to eccentric Little Dot. 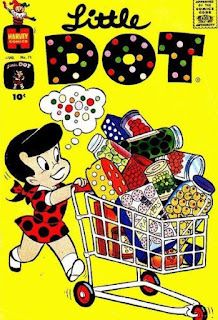 Dot loved dots. A manhole cover, the moon, buttons…..anything round and Little Dot was right there. I’m glad they didn’t do spin offs – Little Triangle, Little Square, Little Stripe. Nah, that would have just been weird. Alfred Harvey (1913-1994), publisher of Harvey comics, created Little Dot and Vic Herman (1919-1999) did the art work. Take a look at Herman’s link – he was an interesting man and did a lot of work for the Saturday Evening Post, Redbook and others. I’m not up on comic books these days. What do 8 year olds read? I still see Archie comics at the check-out but he’s a whole other post. (He’s 71 and still hasn’t graduated high school. He keeps current though - he has a web site ). Anyway, seems like Dot just faded away. One dot too many I guess. A car wheel, a landmine....who knows what brought Dot to an end? I suspect Mr. and Mrs. Polka regretted not naming her Betsy. And by the way, there's nothing so great about being mature!